If you haven't already booked your summer holiday it's more than likely that you have been browsing brochures in preparation of a family getaway of some sort. Whether you're arranging day trips, weekends away or jet-setting to beautiful foreign shores for a few weeks, you will want to ensure your journey is as hassle-free as possible. Although you may normally limit your child's access to games consoles and tablets, when travelling they are really handy to have to hand. There are some great apps to keep them occupied for a few hours, which have educational benefits too, so you can focus on driving to your destination or getting checked in at the airport peacefully while they play. DVD players are equally as useful at keeping little ones occupied - they can watch their favourite Disney films quietly. The Mini Mes love to be creative, as do most children, so providing them with a simple pad of paper and a few colours will certainly put smiles on faces, without breaking the bank. You can ask them to draw specific things they see from their window, a holiday activity wish list or get them to doodle different people before working out who they've drawn - just like Sunlife did in their celebrity drawing quiz. You might want to add in a few stickers for added fun also. Games like 'I Spy', 'Who am I?' and 'I Went to the Shop and Bought' are all free and a great way to kill time when you're sat in the car, on a plane, train or boat, while also developing observational and memory skills. You can also prepare a few check lists attached to miniature clipboards so the children can keep an eye out for specific vehicles, landmarks or animals while on the go. If they like being competitive you can even award points for different items and see which sibling wins. With so many packed with puzzles and bursting with stories, magazines are great for taking on your travels and popping in your hand luggage. Children will have fun reading about some of their beloved characters and with free toys attached they are good value entertainment. Magnetic books are also low cost and feature favourites like Peppa Pig, Ben & Holly's Little Kingdom and the Gruffalo. Children can create scenes and start all over again whenever they wish with no stationery required for minimal mess. You're never too young to learn a new language and it's definitely worth remembering a few important phrases while abroad. There are some fantastic easy audio courses suitable for children which teach French, Spanish, German, Portugese etc and books to refer to quickly when needed. 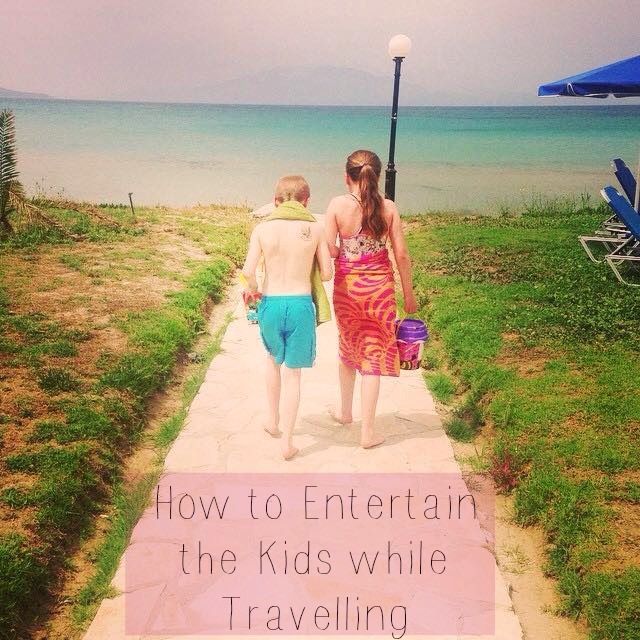 How do you entertain the children while travelling? I like the idea of learning a language while travelling. I wonder if I could persuade my son to do that. We haven't tried to learn a language in the car so that's a great one to try next time. Thanks. I like the idea of children learning a language if you are going abroad. I think tying it in with the destination would help keep them interested. Fab ideas. I was a total bookworm when I was a kid, so my parents had it easy! I love the idea of learning a language, we always learn a few words in each country we go to and have made it a family tradition to learn "ice-cream" as well as the usual please thank you hello etc. It's very useful!!! I love the idea of learning the language of the country you're travelling to, on the journey there! We usually tell stories, listen to music and have a heap of activity books in the back of the car. Some great ideas , we always take playing cards like undo, snap and the kids like that. I remember spending hours playing i-spy in the car as a kid, now it is all about the iPad! Love the idea of learning a language. So many fab resources available for little ones too. I love finding bargains in the £1 shop for travel too. Thanks for joining the #myfamilytraveltips linky!